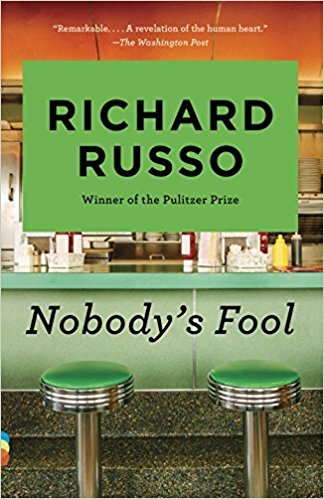 Casting about for something to read last night I found myself sampling Richard Russo’s most recent novel Everybody’s Fool which came out last May. 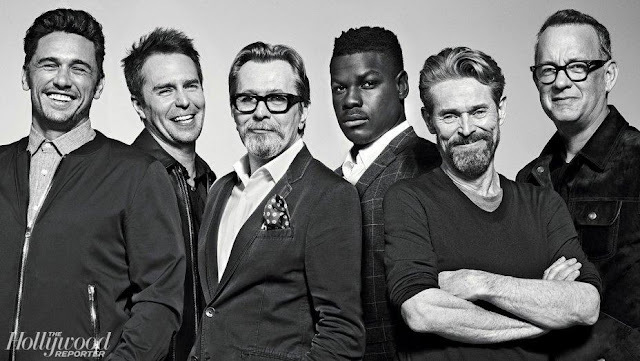 The book is a sequel of sorts to Nobody’s Fool, featuring characters we loved and beloved actors we’ve since lost. Those characters are back in Everybody’s Fool, at least on the periphery in the beginning of the book which features Detective Raymer more prominently. Raymer was played by Philip Seymour Hoffman in Nobody’s Fool, Sully by Paul Newman and Miss Miss Beryl by Jessica Tandy. 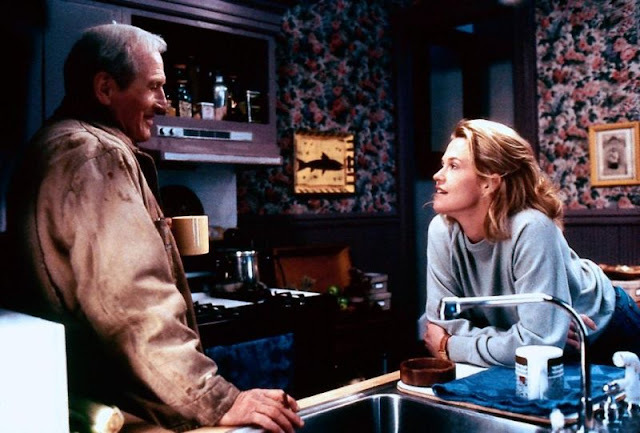 Reading those first few pages made me a little homesick to see those characters in the flesh again, so for today’s Saturday Matinee I’m revisiting Nobody's Fool, the 1994 film based on Richard Russo’s novel of the same name. I love the people Russo writes about, working class folks with working class problems, the triumphs and the tragedies we bring about through our own myopic frailties. 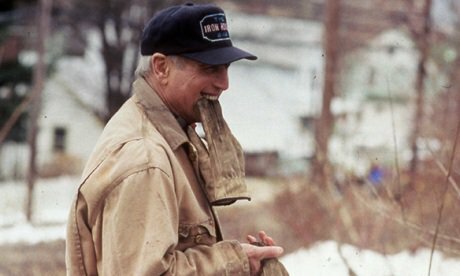 In Nobody's Fool Paul Newman plays a hard-drinking, hard-living sixty year old man whose life, frankly, hasn't amounted to much. Newman was close to seventy at the time. His life, his own character, were worlds away from a man like Sully, yet he was able to find him inside. 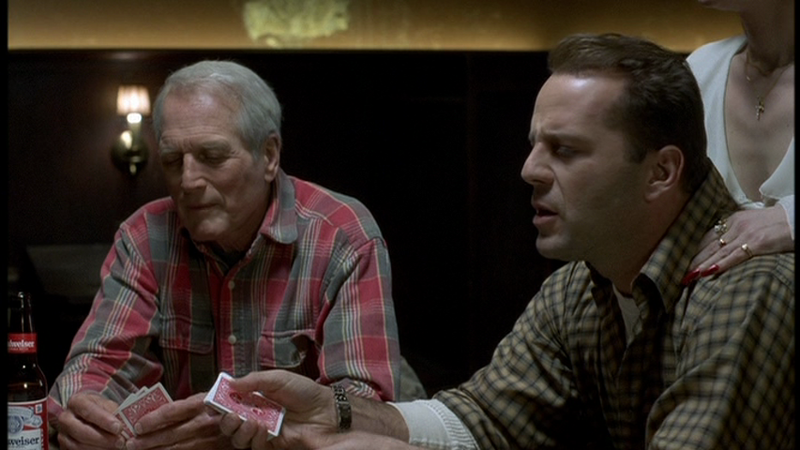 Newman was always able to find those men, those lonely outsiders, within; Butch Cassidy, Cool Hand Luke, Fast Eddie. Men who weren't interested and weren't able to live in the usual manner, to run their lives along the prescribed route. Paul Newman was nominated for a Best Actor Oscar for his performance but it was 1984, the same year Forrest Gump came out. He lost to Tom Hanks. Nobody’s Fool is a darkly comic story—the screenwriter Robert Benton was nominated for his adaptation of the book but he lost to Eric Roth, for his adaptation of Forrest Gump. It was a Forrest Gump year. 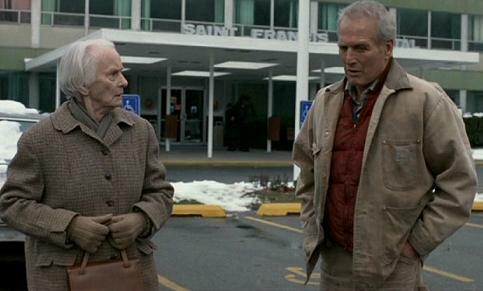 Still, it is an extraordinary performance by Paul Newman. Rather than blather on, I’m going to let the late, great Roger Ebert say it for me. Nobody does it better. “Sitting in the dark, watching Paul Newman's performance in "Nobody's Fool," I jotted down the word "humility." It seemed to be the word that fit best. He is onscreen in virtually every scene of the movie, playing a 60-year-old man named Sully who has spent most of his life drinking beer and avoiding responsibility and who now is thrown into daily contact with a son who doesn't trust him and a grandson who doesn't know him. Sully decides to change - or has change thrust upon him, which amounts to about the same thing. 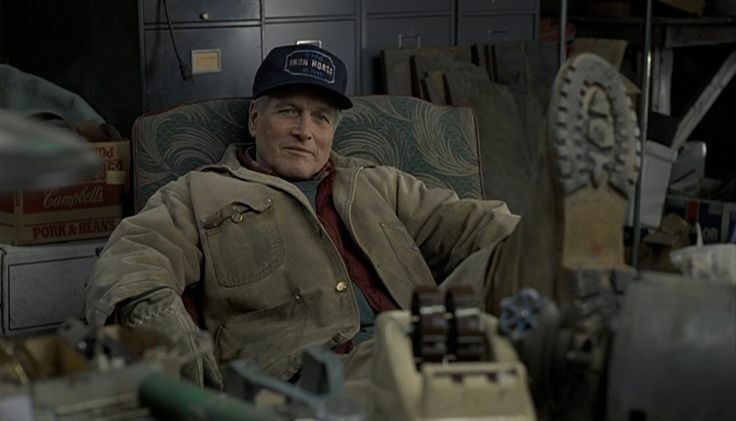 I have been watching Paul Newman in movies all of my life. He is so much a part of the landscape of modern American film that sometimes he is almost invisible: He does what he does with simplicity, grace and a minimum of fuss, and so I wonder if people even realize what a fine actor he is. We remember the characters instead: Fast Eddie Felson, Hud, Butch Cassidy, the alcoholic lawyer in "The Verdict". . . 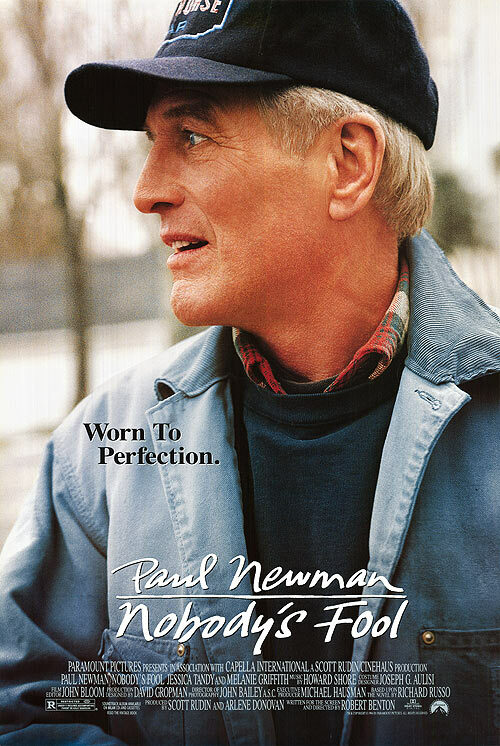 In "Nobody's Fool," Newman plays another heavy drinker, the kind of feckless free spirit you occasionally meet: A man who has never grown up, who despite his carefree disregard for the ordinary requirements of society, remains somehow so charming and innocent that people forgive him his sins. He has found an economic niche that supports his lifestyle. He does construction work for a local builder. He rents a room upstairs in the house of his eighth grade teacher. Of course freedom has a price. He has long ago departed from his marriage, and his son has grown up almost a stranger to him. His "family," such as it is, consists of the regulars in a neighborhood bar: An old lawyer, a barmaid, a co-worker who is mentally retarded. At one point in the film he talks about his ex-wife with his son, who says, "Mom's biggest fear is that your life was fun." To which he can honestly reply: "Tell her not to worry." Sully works on and off for a local contractor named Carl Roebuck (Bruce Willis). And he has been conducting a sort of arm's-length flirtation with Carl's wife, Toby (Melanie Griffith). It involves a lot of wishful thinking on both sides. Sully's best friend is Rub Squeers (Pruitt Taylor Vince), a mildly retarded local handyman who helps out on jobs. One day the even pattern of Sully's life is interrupted when his son, Peter (Dylan Walsh) comes back into his life. Peter is a college teacher. His marriage is breaking up, and he returns to his old hometown with one of his two children (his wife keeps the other, for the time being). He has no clear plan. Perhaps he will work with Sully on construction for a time. This does not sit well with Rub, who feels rejected, and quits so he can sit on his steps and sulk. 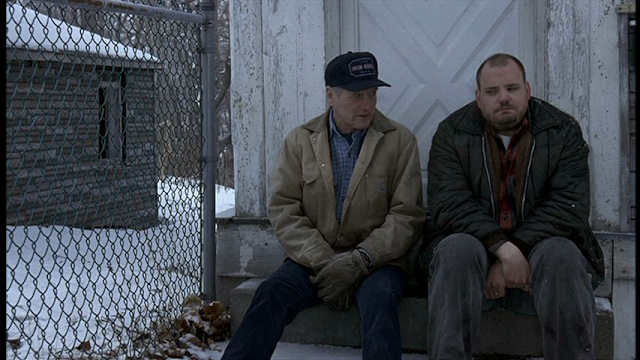 It is the middle of the winter in the small town, which seems almost uninhabited (director Robert Benton wisely focuses on the foreground characters in his story, and mostly avoids extras). 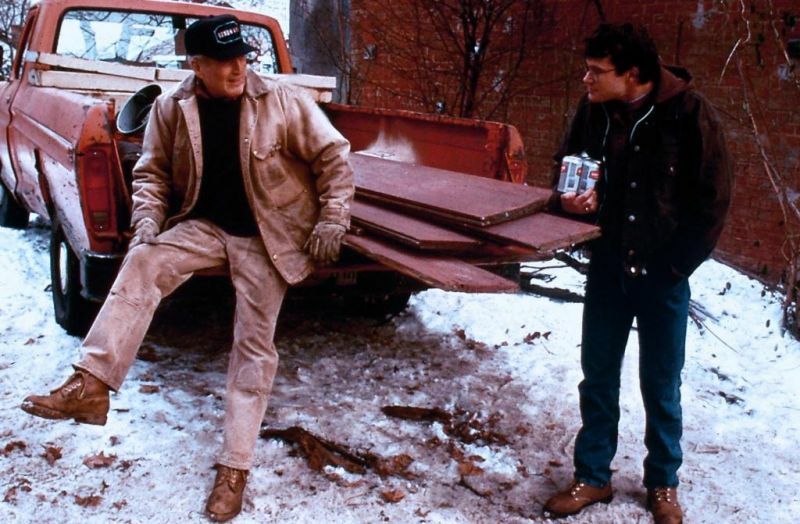 Sully is engaged in a long-running duel with Roebuck, involving the theft and recapture of a snow blower. Otherwise, with work scarce, he hangs out in the local saloon with his drinking buddy Wirf (Gene Saks), who is also his lawyer in a seemingly endless string of cases involving workmen's compensation and traffic violations. In a sense, not much happens in "Nobody's Fool." In another sense, great changes take place. Sully is a man who has put his truly important issues on hold for a very long time, while making a cause out of trivial issues. He will, for example, go to great lengths to steal the snow blower, or to score points off a dim-witted local policeman. But now, with Peter back, he finds that all the big issues of his early life - his marriage, his family - are staring him in the face again. Above all, he is challenged to be responsible to his young grandson as he never was to the boy's father. The story, written by Benton from the novel by Richard Russo, unfolds according to its own logic. It has the patience to listen to silences. Above all, it benefits from the confidence of Newman's performance. He is not hammering the points home, not marching from one big scene to another, but simply living on the screen, and if the film's last shot is of Sully sound asleep, by then we understand why he has earned his rest. The best moments in the film are based on relationships. Sully is quite fond, for example, of his landlady, old Miss Beryl (Jessica Tandy, in one of her last performances). He has a bantering relationship with Wirf, the lawyer who seemingly has only this one fool for a client. 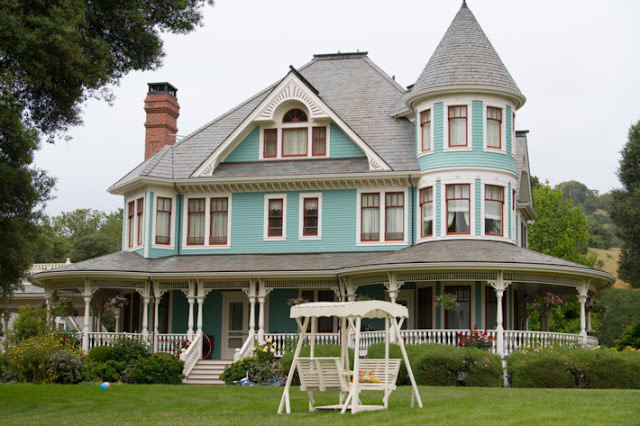 His pipe dreams with Toby, which involve the two of them flying off to Hawaii, are important to him, because he is a romantic - and to her, because she trusts his goodness, and is fed up with her husband. And there are other characters, including a woman bartender and the local police chief, who help create the character of Sully by the way they respond to him. At the center is Paul Newman. He is an exact contemporary of Marlon Brando, who is said to have invented modern film acting. Yes, and he probably did, stripping it of the mannerisms of the past and creating a hypercharged realism. Like Brando, Newman studied the Method. Like Brando, Newman looked good in an undershirt. Unlike Brando, Newman went on to study life, and so while Brando broke through and then wandered aimlessly in inexplicable roles (especially since "The Godfather" 20 years ago), Newman continued to work on his craft. Having seen what he could put in, he went on to see what he could leave out. In "Nobody's Fool," he has it just about figured out. I loved this movie. I must see it again. Thanks for the reminder.